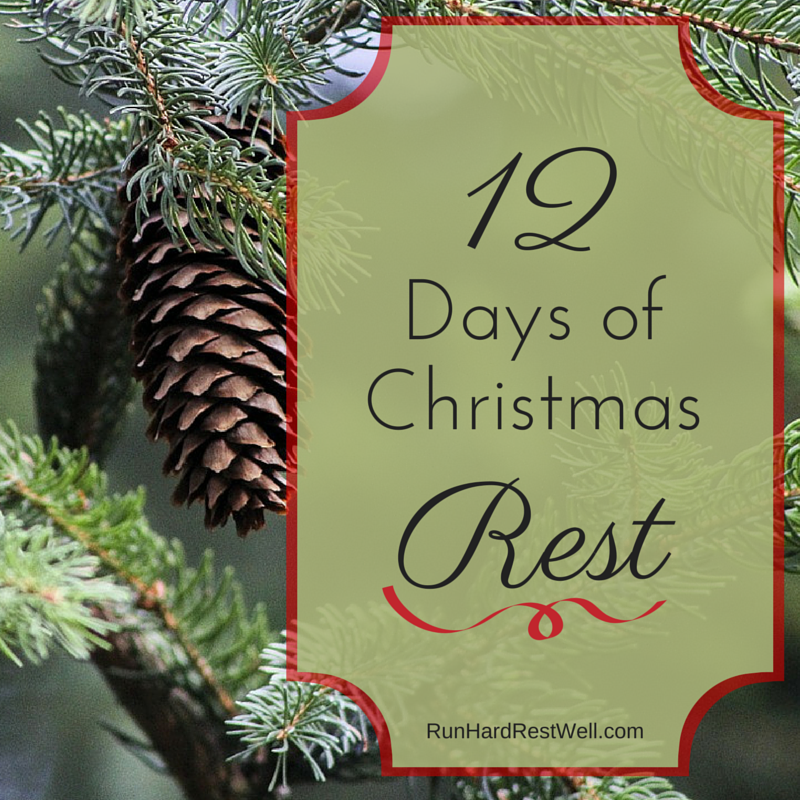 12 Days of Christmas Rest • Run Hard. Rest Well. Christmas rest, at its best, might be found in the 12 Days of Christmas. It begins one week from today on December 26 and ends on January 6, the day commemorating the arrival of the Wise Men. Want to make this a Christmas to remember? Try some of these 12 Days of Christmas Rest suggestions. Most won’t cost a dime, but they will line your heart with treasures. And you can’t go wrong—all of these ideas have all been field-tested and kid approved. Why keep the celebration of Jesus’ birthday confined to a single day when we can be blessed by 12 Days of Christmas Rest? Roast mini marshmallows over candles with toothpicks. It will make you smile. (If a little girl with long hair joins you, pull her hair back with a pony tail.) Want to have some extra fun? Make them into s’mores with Golden Graham cereal and chocolate chips. Write the Birthday Babe a love letter or make Him a card. This little ‘pause with a cause’ will bless your heart and make His day. Listen to “O Holy Night” in a darkened room, watching the flickering flame of a candle. Buy your favorite protein snack (nuts, cheese sticks, peanut butter, hummus) and add that to any high carb-snacks to off-set the sugar crash that’s bound to take place. Sleep. Remember, winter is a time for hibernation! Give and get a foot massage. Take a night time stroll under the stars, through a city block full of lights, or when the snow is gently falling. Bundle up. Grab a friend. Listen to the quiet. (Next year) Visit the bank for a fist full of ones, fives or quarters. Keep them handy. Every time you pass by a Salvation Army ringer, give with great joy and lift up a prayer for the people who will be blessed. Make each gift a celebration of thankful joy. Read your Christmas cards in the glow of your Christmas tree lights. Receive each wish and prayer. Don’t rush. Pause and pray. Buy yourself a Frasier Fir candle from WoodWick. The wooden wick crackles and the scent is incredible. Enjoy it all year long. I do. Initiate some Christmas Tree Time. It’s our family favorite. What does this mean? Lights off. Tree on. Cozy cuddle time (or not so cozy depending on the end-of-the-day temperament of any given person—big or small). Through the years we’ve thoroughly enjoyed reading the adventurous Advent stories of Arnold Ytreeide: Jotham’s Journey, Bartholmew’s Passsage, and Tabitha’s Travels. Powerful and riveting, these 3 books have shaped and defined our Christmas Tree Time. Each chapter ends with a cliff hanger, leaving our kids begging for more. We end our time together with a Christmas carol or two. Do we do it every night? No, but when we do, we are richly blessed. (Hey – please note. These stories may be too adventurous for little ones.) Did you get some money for Christmas? Order these books today. This year I have a brand new Christmas decoration sitting on my kitchen sink windowsill. It’s a 2-inch Star Wars figure with a lightsaber in one hand and a shield in the other. He’s reminding me to guard our Christmas Quiet, our Christmas Rest. Love-Come-Down. He will see to this miracle in the making. What might you do to guard and bless your 12 Days of Christmas? We cannot wait for a convenient time. It will never come, not in December, nor in the New Year before us. Stillness must be made. Carved out. Shielded. Protected. Thank you so much for sharing these awesome treats! Merry Christmas ! may your holidays be peaceful and bright! These are quiet time joys are a treat! May we ALL enjoy and be blessed. Great suggestions, Brenda! I’m interested in the Jotham’s Journey trilogy, but do you think my teens would feel too old for this? Or would they find it meaningful? Kayla is 13 and Noah 16 now, both a year older by next Advent. Kip, Our crew is 14-21 and we are still enjoying them. They will be treasured by all. There is also an Easter story, too. Another brilliant treasure. Get all 4. Joy to the world…the whole wide world! I love this. My kids will be out of school. My crazy retail hours winding down to a sense of normal. Perhaps this Christmas Eve, I will attach prayers to the tree and label them from the 25-31st. Each day from Christmas to New Years will bring a new sense of reflection. Merry Christmas!! Love it! Love that idea! We’re going to add that one this year. Can’t wait. Thank you!!! Wonderful ideas, Brenda. Don’t think I’ll wait for the 26th to enjoy Christmas rest. Merry Christmas. May this holiday be the best ever! Will Sam be able to come home? Thank you again dear sister…am older than dirt and can’t wait to order these books. Remembering times when my brother and I would invite a few friends, bake and decorate cookies and while we were waiting for the cookies to cool we would turn all the lights off in the house and then lay with our heads against the trunk of our tree…our bodies forming spokes outward like a wheel. We were all a part of that circle and as we looked up into the tree and its wonder, we would each share a thought about the light, the birth, the death for us, of our Lord, and the glory of Christmas…sometimes cookies didn’t turn out, but ‘our time’ was sacred. Linda, I did the same thing. I think that’s when Christmas Tree Time was born. My mom and I also used to snuggle on the couch late into Christmas Eve when I was in high school. Order the books. You will love them. Gripping. Real. Powerful. There’s an Easter one, too. Get it. Treasures every one! Love this Brenda! Such great ideas…we are going to start incorporating mm hhygsome of these traditions. Special, special times. Thinking of you, too, and the precious crew you’re watching. It was so good to see you. Your compassion and love are gifts. Christmas blessing quiet and full! OXO!